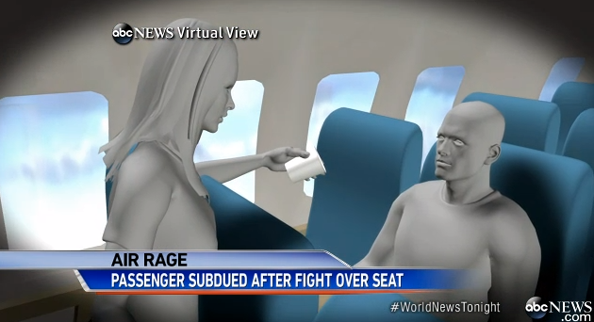 On Thursday’s “World News,” ABC News was covering the recent “slew” of airplane incidents regarding altercations between passengers and decided that, apparently, it was necessarily to illustrate what a woman throwing a glass of water on a fellow traveler looks like. 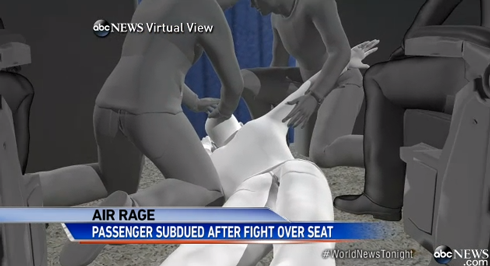 Since there was no actual video footage of the incident available to ABC, the network opted to use its “ABC News Virtual View” — a fancy way of saying 3D renderings — to illustrate the water throwing incident as well as several others that have been in the news. 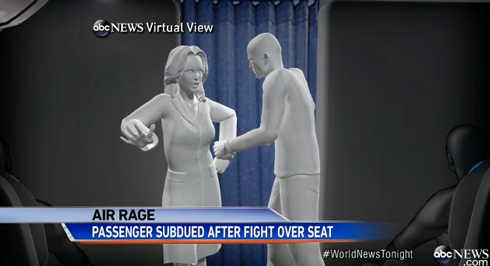 …and a view of a woman giving a man, who is throwing his arms up in the air in (apparent) disgust, the evil eye. 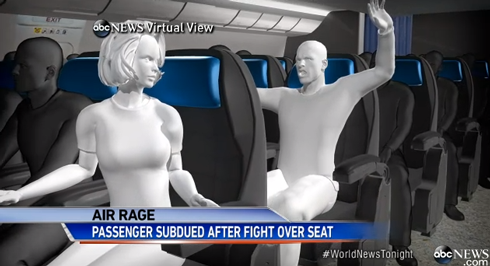 Of course, ABC is hardly alone in its use of animations such as these, especially in situations like this where there is little or no actual footage, but these seem a bit trite and cliche. Also — in true “television magic” form, the animations make, at least to us, an airplane cabin look awfully roomy — when was the last time you flew on a plane with enough room for three grown men to fit in an aisle?